Looking for a one-of-a-kind venue to host your wedding? Here, we've compiled 50 of the most unique spots in the USA! 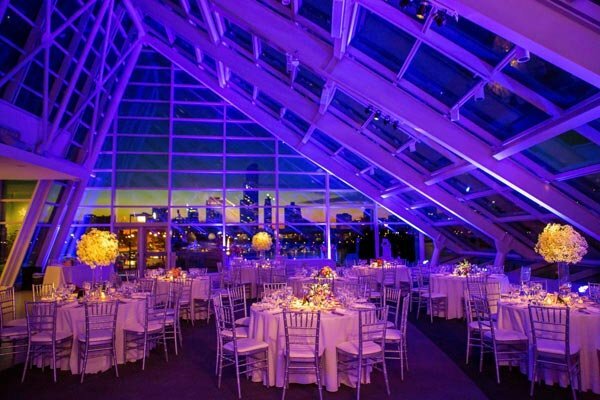 Whether you opt for a futuristic-feeling affair inspired by the Gallery and Sky Theater’s domed ceilings or decide on the terrace with waterfront skyline views, each of the planetarium’s six options offers a distinct ambience. From the sweeping backlit staircase and dramatic balconies to the ornate fixtures, the intricate architecture of this historic building creates a show-stopping backdrop that doesn’t require any additional décor. The Artist’s Covered Bridge provides a picturesque location for a scenic outdoor affair. Exchange vows during a secluded ceremony over the rippling Sunday River while surrounded by trees and the White Mountains. This 12-story atrium is on the list of Philadelphia's historical spaces for its oversized 1915 Tiffany mosaic. From the two-story waterfall fountain to the ornate marble details, the Atrium at Curtis Center is a lavish space for up to 500 guests. Exchange vows in front of ivy-covered castle ruins at the summit of Gibbet Hill with sweeping views of Mt. Wachusett, Mt. Watatic, and Mt. Monadnock. Not only is Barr Mansion, a house dating back to 1898, on the National Register of Historic Places, but it also has a reconstructed 1700s New York Dutch barn built with lumber from trees that were living when Columbus came to America. Let Big Daddy’s Antiques’ inventory of one-of-a-kind pieces create a memorable backdrop for a shabby-chic celebration. Each showroom provides a unique atmosphere, and the industrial courtyard offers an equally cool outdoor option. Silver Falls State Park offers hundreds of intimate locations to host your affair. From waterfalls, creeks, bridges, and meadows to historic buildings, shelters, and ranches, personalize your rustic affair at this year-round venue. Reconnect with nature when you invite guests to celebrate your nuptials at these waterfront campgrounds. The exhibition includes eight galleries that provide a look at what influenced Dale Chihuly’s art career. The Glasshouse is the exhibit’s centerpiece and is a glass and steel structure complete with an expansive suspended sculpture. Celebrate your wedding atop the historic Clock Tower. A recent renovation gives the space a modern vibe while the panoramic city views, and the mysterious clock faces offer endless photo opportunities. This Colorado mountain venue recently added a reconstructed Civil War-era Ohio barn with east-facing views of the Continental Divide. For a smaller affair, consider the converted hay loft with two Rumford style stone fireplaces. No matter the size of your affair, guests will be enchanted by the charming open air chapel, luxury cabins, and mineral hot springs at Dunton Hot Springs. With space for up to 20,000 guests and ten different spaces to choose from, Fenway Park is available for more than just baseball. From the deck’s panoramic views of the ballpark to to the skyline vistas atop the Budweiser Right Field Rooftop, the unique photo opportunities at this iconic stadium are endless. When you host an event at The Foundry, you can take advantage of both the main raw space and the industrial mezzanine. Between the Egyptian Ballroom and the Grand Salon, your soirée at Fox Theatre won’t be anything short of lavish. The grand arcade entrance — complete with a vintage marquee — sets the tone for a memorable affair, and the Moroccan tiles, mosaics, and stained glass enhance the ornate feel. After greeting guests on the Vista Terrace, which overlooks breathtaking views of Sonoma Carneros, invite everyone to enjoy a local dinner in the main cave. This seasonal venue offers a memorable and ambience for an intimate gathering. This glamorous wedding destination was once a sugar cane processing factory and now hosts endless stunning events under a canopy of dripping foliage. Invite guests to celebrate your nuptials at an outdoor chapel complete with manicured gardens and pecan trees, followed by a reception at the 6,000 sq. ft. heated pavilion. Nestled on over 110 acres of pastoral fields sits this open-air church that provides an equally unique and serene wedding experience. From the century old brick walls and arched windows to the steel beams garden complete with an Art Deco-style fountain, this historic substation is filled with character. If you’re looking for an eclectic vibe in downtown Phoenix, consider this old icehouse, which manufactured 300 pounds of ice blocks in the 1920s. Icehouse Arts is now a cultural center and the urban space offers refined architecture with an industrial edge. With a sleek glass and steel facade, it’s no surprise that this seven-story, glass-enclosed structure is an icon for the city. Located 17 feet above downtown Indianapolis, the Artsgarden is a performance venue that connects the Embassy Suites complex, the Conrad Hotel, and Circle Centre Mall complete with an indoor skywalk. This Art Deco building is a historic greenhouse with an impressive floral display area and water feature. With unconventional 50-ft. vertical glass walls, the Jewel Box overlooks 17 acres of Forest Park. Have guests follow the yellow brick road to your whimsical wedding celebration at the Land of Oz theme park at Emerald Mountain Properties. This Wizard of Oz-inspired theme park closed in the ‘80s and now the mountainside complex is available to rent for nostalgic outdoor affairs. Host your wedding along the sandstone banks of the St. Vrain River with the dramatic redstone cliffs as your backdrop. Bonus: The large property offers a groomsmen's cottage and a glamping tent for brides, complete with a chandelier. This art and history museum offers five separate historic spaces to chose from, including the enchanting Mayan Courtyard with embellished tiles, stunning landscaping, and a covered walkway. Elevated over 2,000 feet in the Santa Monica Mountains, this 37-acre plot private vineyard offers 360-degree views of rolling hillsides. For a wow-worthy location, consider swapping vows surrounded by military aviation. Guests will enjoy learning about the history of aviation, and you’ll love the incredible photo opportunities at this non-profit organization. For the animal lovers looking for a memorable spot, check out Marineland. With exclusive use of the habitat deck, your guests will be entertained throughout the night, but be warned: the dolphins might steal the show! Located on the historic Mississippi Riverfront, Mill City Museum was built into the ruins of what was once the world’s largest flour mill. Swap vows overlooking your beloved Beaver Stadium at the Mount Nittany Club. Embrace the industrial feel at the world’s fourth largest stadium, complete with steel beams and field views. Experience mountaintop views overlooking 350 acres, including the National Forest and mountain lake. Take advantage of the knoll or barn at this classic lodge amidst the Green Mountains for a rustic destination celebration. The modern aesthetic and sleek white spaces allow for a contemporary celebration at the Museum of the Moving Image. You’ll love the dramatic feel of the theater for ceremonies, and guests will appreciate the freedom to explore the museum’s interactive experiences during the reception. The grand archway of the Natural Bridge is nestled in the Shenandoah Valley and backed by the scenic Blue Ridge Mountains. Set in a wooded grove next to a small stream, Nazareth Hall’s grotto was built in the 1920s to be a replica of the famed grotto in France using coral formations imported from the Mediterranean Sea. With a 1908 carousel, 70-foot flowing river, and Alice in Wonderland’s Garden, this unconventional event space caters to equally fancy and fun events. Located in the Lower Garden District, this two-story Creole cottage is made up of three structures on the riverfront property. The ruins of this grand Southern country estate provide a unique stone backdrop among the manicured lawns. Set in a repurposed century-old factory in Seattle’s historic SoDo district, this urban loft offers 7,500 square feet of customizable event space. The vaulted ceilings, exposed beams, and reclaimed lighting blend a modern and rustic aesthetic that can be dressed up or down to complement your affair. A front porch ceremony at an Antebellum-style mansion, with exclusive use of the entire plantation for your celebration, is a fun twist on the traditional Southern soirée. For an unexpected outdoor spot, exchange vows in the historic Cathedral Park among the Gothic arches that support St. John’s Bridge. Choose from the restored antique greenhouse, seasonally-decorated lodge, or romantic terrace for a personal event. From the horticultural setting to the farm-to-table cuisine, this restored barn has it all — including a show-stopping Indian wedding temple that serves as the centerpiece for many celebrations. Unique rock formations and a lush canopy of trees surround this stunning glass cathedral in the woods. With over 6,000 square feet of glass and 425 windows, Thorncrown offers both outdoor and indoor options for up to 100 guests. Enjoy exclusive use of the entire four-acre property while you swap vows deep in the forest, surrounded by lush trees and a tranquil river. The historic building facades and horseshoe staircase at the Upcountry History Museum provide an unexpected backdrop for an indoor bash. With dramatic vaulted ceilings and an abundance of natural light, this historic venue offers a memorable rustic setting with expansive grounds. With picturesque red sandstone formations, the vistas that Nevada’s oldest and largest state park offers are nothing short of incredible. Also known as the “Glass Chapel,” this impressive sanctuary welcomes couples from all religious backgrounds to tie the knot surrounded by landscaped gardens and views of the Pacific Ocean and Catalina Island.